TESTING LAB — Fasteners Unlimited inc. Fasteners Unlimited has been a manufacturer and distributor of high quality parts meeting thousands of different standards for many years. Through our facility you will find our testing lab warehouse where we have certified employees testing our materials, and dimensions of each of our parts. We certify with our name standing behind it. Below are a few examples of our capabilities here at Fasteners Unlimited. In our lab we have an optical comparator, or also commonly known as just a comparator. This tool allows our employees to inspect all the visual points by the principals of optics. For instance in this photo to the left, we are able to control the root radius of the said thread and manufacture precisely to the print. Also a very helpful tool during the manufacturing process. We deal with certifications calling for magnetic particle inspections very often. We house a magnetic particle inspection station or (MPI); This non destructive testing will allow us to test materials for cracks or other flaws you can have in ferromagnetic materials. We not only inspect our own manufactured parts, but will also take on jobs that need the service of magnetic particle inspections done since we are a certified corporation. Hardness is a characteristic of a specified material, not a fundamental physical property. It is defined as the resistance to indentation, and it is determined by measuring the permanent depth of the indentation. 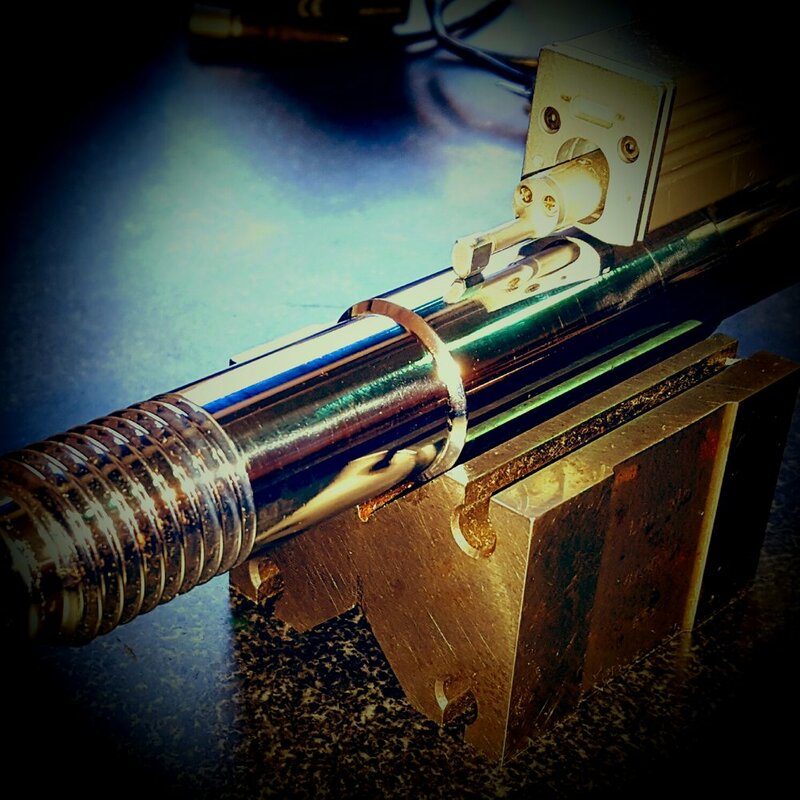 Hardness testing is a very important aspect to our inspections and machining process. This tool can help us identify if materials are suitable for a job before machining and gives us the true harness value after the part has been manufactured. Surface finish, also known as surface texture or surface topography. This is the nature of a surface as defined by the three characteristics of lay, surface roughness and waviness. It comprises the small local deviations of (a true plane). Surface finish comes into play frequently in high tolerance machined parts. This process will allow evidence that the surface will be in tolerance so all engineering will be accurate and the application will perform to its intended use. Tensile testing, is also known as tension testing. It is a fundamental materials science test in which a sample is subjected to a controlled tension until complete failure of the test specimen. This test results in the absolute strength of a given specimen. It is one of the simplest and most commonly used mechanical tests using both the wedge test and also axial. Also environmental tests at high temperature testing to further understand how heat effects the part itself. By measuring the force required to stress the specimen to a breaking point. This allows the engineers and design teams to accurately predict how materials and products will behave in there intended application. Here at Fasteners Unlimited we are able to do in house etching and work with a close partner who specializes in electrochemical etching. In certain industries the physical disruption of etching or stamping into the material is not permitted, this is where electrochemical etching comes into play perfectly.